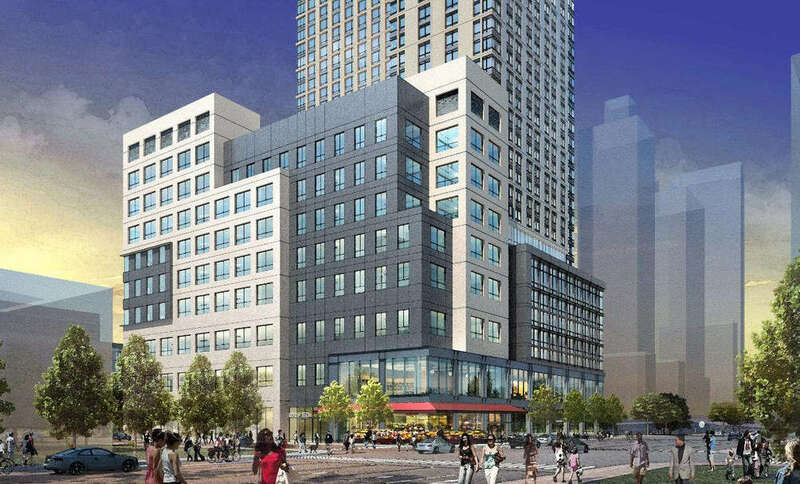 UPDATE: On June 21, 2017, the City Planning Commission the application from the New York City Education Construction Fund and AvalonBay Communities to redevelop a city block in East Harlem to be appropriate. The proposed development would shift the Marx Brothers Playground to the center of the block and facilitate the construction of two buildings at either end. The eastern building would rise eight stories and contain two public high school relocated from other sites. The western building would rise 63 stories and contain over one million square-feet of residential floor area and the Co-op Tech vocational school. The proposed rezoning would facilitate the construction of two new buildings for three high schools, up to 1,200 new apartments, over 300 affordable units, 1.5 acres of playground, and up to 25,000 square feet of new retail space. On May 10, 2017, the City Planning Commission held a public hearing on an application for multiple land use actions to facilitate the development of a replacement facility for an on-site existing school, a new facility for the relocation of two existing local public high schools, a mixed-use building, and the relocation and rehabilitation of an existing jointly-operated playground. The applicants, the New York City Educational Construction Fund and AvalonBay Communities, proposed the redevelopment of a city block bounded by First Avenue to the east, East 96th Street on the south, Second Avenue to the west, and East 97th Street to the north in Manhattan’s East Harlem neighborhood. Currently the western portion of the project site is occupied by the Marx Brothers Playground, a 1.49 acre playground with playground equipment, bathroom facilities and a turf field for soccer and softball. The eastern portion of the site contains CO-OP Tech, a citywide vocational program. The school operates in a four-story, 103,498 square foot building. The proposed project would create a 63-story building containing 1,175,000 square feet on the western portion of the block, facing Second Avenue. 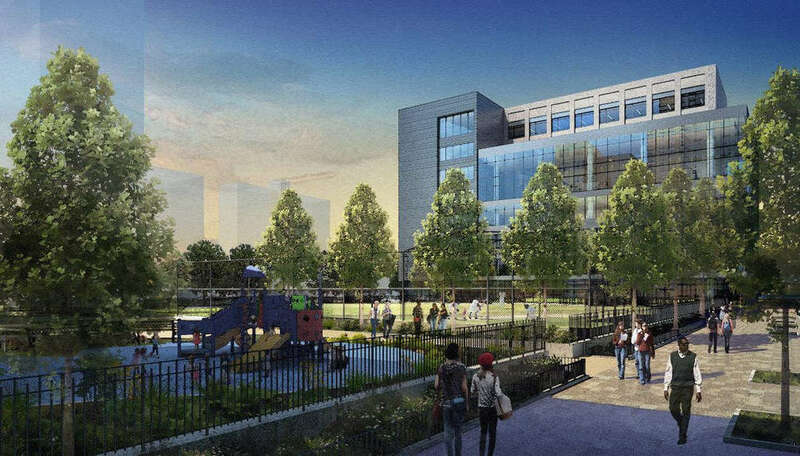 The western building would contain over one million square feet of residential use, about 25,000 square feet of commercial use and about 135,000 square feet of public school use for CO-OP Tech. Thirty percent of the residential units would be marked as affordable permanently under the Mandatory Inclusionary Housing law. An eight-story building containing 135,000 square feet would be constructed on the eastern portion of the block. The eastern building would hold two additional public high that would be relocated from nearby locations. The Marx Brothers Playground would be shifted to the center of the block between the two new buildings. At the May 10th hearing, Jennifer Maldonado, Executive Director of ECF presented the project to the Commission. According to Maldonado, ECF had been working with Manhattan Community Board 11 and Borough President Gale Brewer, and had received their conditional approval. As part of those negotiations, the taller structure would be reduced from 68 stories to 63 stories. Maldonaldo did warn that reducing the project any further would make it unlikely ECF could recoup the bonds for the project. The bonds would total over $300 million to fund the school portions of the project. Martin Piazzola, Senior Vice President of Development at AvalonBay Communities, spoke to the constraints of the development. Specifically, the western building would need to be constructed first to allow for one transition for CO-OP Tech from the eastern portion of the block to the new western building. Piazzola also explained that the smaller floor plates of the buildings was required because by law the park was required to remain the same size and configuration. Commissioner Cheryl Cohen Effron questioned the height of the taller building, noting that the closest tall buildings were 35 stories. A representative for Perkins Eastman Architects also explained the logic behind the proposed design configuration. Specifically, that elevators, plumbing, fire staircases, a lobby, loading dock and electrical conduits would force the school to require more floors and limit auditorium and multipurpose room sizes because of columns. And residential units above the high schools would be subject to higher seismic response standards, the same as the public schools are subject to. Commissioner Anna Hayes Levin wondered if ECF was asking the developer to force too many public goods into the development, still criticizing the height of the building being over 700 feet tall. Maldonado agreed that it was a large project but remarked that ECF has an opportunity to really build schools and ECF can only do so through bonds and no capital spent by the city. A representative from Borough President Brewer’s office spoke in favor of the project. The representative did express ongoing concerns about school congestion and neighborhood character impact. The Borough President, however, was still in favor of the project because of the overall positive impact. Andrea Shapiro-Davis, a local resident, testified against the project. She remarked that the western building would be the tallest than any building in the Bronx, Brooklyn, Queens and Staten Island. She further noted that the park would be in perpetual shadow, comparing playing into the park as if in an “elevator shaft.” Shapiro-Davis also noted that over 70 percent of the apartments would be market rate and unaffordable to the residents of East Harlem. She criticized an easement that would be granted on the parkland and the portion’s alienation to ECF, thereby reducing park size. 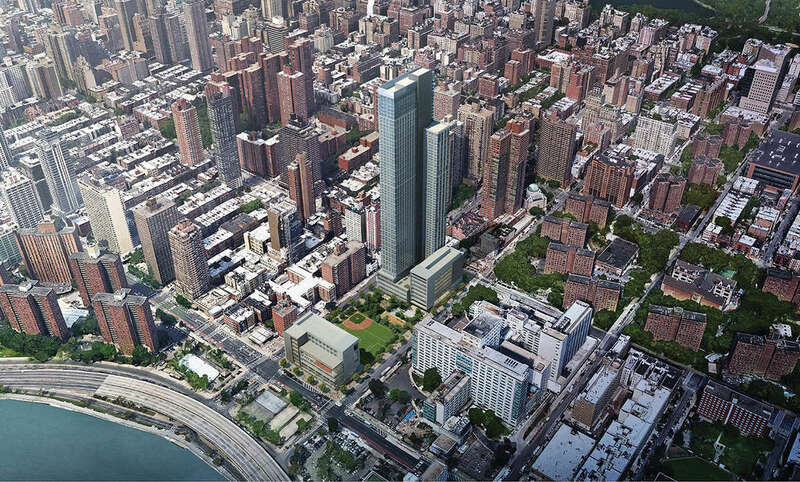 A resident testified against the project, criticizing the additional public congestion which would be created with 5,000 new residents in the 63-story tower. Another resident described the building as “manifestly inappropriate,” and wondered why the Commission would disregard reasonable zoning regulations. Another resident discussed the safety of the children being placed in peril by adding three schools onto an already traffic congested street. The president of New York City Park Advocates testified that for more than 60 years children have enjoyed a sunny play area in the playground because it was located on the corner lot. He remarked that the proposal would eliminate that use. Additionally, he argued that creating development rights out of a public park was a misuse of the public use doctrine. He noted that the park has been completely open to the public and that the change would limit public use of the playground to after school hours. Caroline Harris, of GolmanHarris LLC, working with Carnegie Hill Neighbors, also testified in opposition. As a zoning attorney, she described the plan to transfer the park and the rest of the block to ECF as a circumvention of basic zoning principles, specifically the definition of a zoning lot and that parks do not have development rights. Harris argued that the Draft Environmental Impact Statement and project should not be approved with all the unmitigated impacts listed. She highlighted the already existing traffic congestion which will only increase. She also noted that the any decongestion impact the Second Avenue subway had would be washed away. Commissioner Levin asked Harris to expand on her park land use argument. Harris explained that the park was a boundary of the zoning lot and not part of the zoning lot, and does not generate any development rights. Harris stated that she believed that by transferring the park land to ECF, the park was losing its status as a park thereby generating development rights which would then be harvested for the tower. The park would then be conveyed to the Department of Parks again. CPC: ECF East 96th Street (170226ZMM; 170227ZRM; 170228ZSM; 170229ZSM) (May 10, 2017).